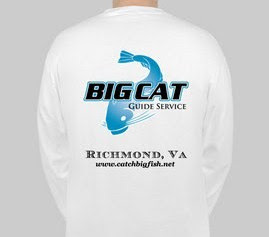 I went out last night to the Pamunkey River which is another awesome river for big catfish. If you have been with me before you have probably heard me talk about it. We saw 1 other boat all night not including my dad who also was out. I've attached a video of our night. It was probably one of our worst trips as far as numbers of fish goes but it was funny and relaxing to be back there. We had one fish that was 47 pounds and my dad had a 10, 24 and 30. The bite was very slow but the weird part was we had 4 hits throughout the night were the fish slammed the pole and pulled drag and then right when you went to pick it up they dropped it. I sat its weird but it is something that has happened before but it just doesn't make sense to me. I talk to someone who fished the James last night and they said the bite was the same there so it must of been a weather related thing. I tried to download a "bleep" sound for the video but couldn't find one. There is some bad language so be warned. I am trying to design some new shirts for '09 Here is what I have so far. Please tell me what you think. I'm probably gonna have to sell them for about $25. That looks like how much its gonna cost to make them.Let me know if you think you are going to want one. Well it's about that time again. Spawn should be about done and some fish are being caught. I did hear for a 60+ last week as well as Capt. Joe(aka my dad) caught on 56 last week. I'm sure ill have some reports after the weekend. As you can see from my previous post I have been focusing my attention over this spawing period on saltwater. It's good to get a change of scenery sometimes. We haven't had much success but we have been learning everytime and will get us a cobia eventually. Tautog season is getting ready to come back in and that is when we will really bring home the meat!